In a previous post, I compared my father taming the wilds of his suburban yard to that of the colonists first arriving in the New World. It’s an interesting idea, when you stop to think of the immense responsibilities facing those early Americans. Imagine – an entire continent to landscape, the creation of a national identity for a fledgling nation. Someone should probably write a book about it. Fortunately for us, Andrea Wulf has. 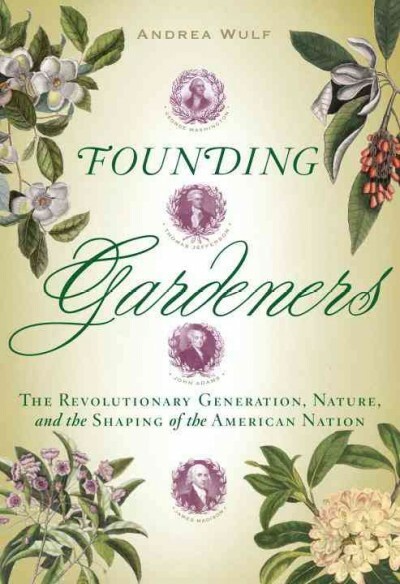 Her recently published Founding Gardeners has been well-received by critics, and rightly so. It is an impressive work that takes an in-depth look at the great figures who shaped a young nation – and she does this by weaving moments in early American history with the beliefs and philosophies of our Founding Fathers, most of whom were avid gardeners, botanists, landscapers and farmers. In fact, they were as passionate about the idea of the United States as they were about seed exchanges and experimenting with new agricultural methods. Rich in historic detail, each chapter is devoted to a revolutionary, starting with George Washington. Her insight and descriptive style paints a new portrait of the men we’ve only considered to be statesmen, generals, or lawyers. As readers, we are treated to each man’s creation of their personal gardens, such as Mt. Vernon and Monticello. Founding Gardeners breathes new life into the American story that has been taught to all of us since kindergarten. As gardeners and dreamers, the heroes all become more authentic for the reader. I, for one, took great delight in learning that as Washington was working to defeat the British, his thoughts would often drift to the crops and plantings at Mt. Vernon. I now know that I am in good company when I daydream of future flowerbeds while sitting in a meeting. This is more than a story of the first days of the United States. It’s also about the creation of a unique American landscape, of using native plants, of combining the aesthetics of gardening with the principles of practicality, of moving away from formality and geometric designs and allowing trees to grow freely. So, as I sit at my July 4th barbecue, looking at my own property, I will remember our Founding Gardeners. They had the foresight and brilliance to create a nation, to write the documents that hold us together, and to know 235 years ago that the key to our nation’s survival depended on how we treated the land. Have a wonderful Independence Day! This book has been on my wish list since I first learned about it (I loved The Brother Gardeners), and your review has made me all the more eager to read it. I just discovered your blog in the past few days, and I’m very much enjoying it. I do a monthly “Garden Blog of the Month” feature on my blog, Jean’s Garden, in which I highlight some garden blogs that I think my readers would enjoy. Your blog is one of three I am reviewing this month. The post just went up a few minutes ago, and your blog will be featured on my sidebar throughout the month. Jean, thank you so much for visiting and for your kind words. I’m honored and thrilled that you put a spotlight on my blog. I’ll add a link on mine to get to you. Cheers!